Looking for a great apartment to rent in Phoenix, Arizona? 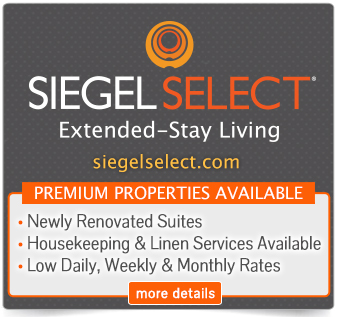 Siegel Suites specializes in low cost apartment rentals throughout the state of Arizona. In Phoenix, we offer large fully furnished studio apartments and large two bedroom apartments at a great location on at a great location on McDowell Road. The apartments are walking distance to restaurants and shops and offer easy freeway access. Rents are surprisingly cheap for all you get, including apartment extras like free premium cable TV, free utilities, and more. Plus, we make it easy to rent an apartment with optional weekly* rates, no long term lease, and bad credit ok. So, call us at 1-888-328-0192 to rent Phoenix apartments!